We are now hiring a farm worker for this fall. The contract is seasonal with the possibility to extend/renew in the new year. Please see below for details and how to apply. Bluegrass Farm is a certified organic, mixed vegetable farm located in Jasper, Ontario (15 minutes from Merrickville or Smiths Falls; 75 min from downtown Ottawa). We are a small family farm, now in our seventh year of organic vegetable production, and our fourth year farming on this property. 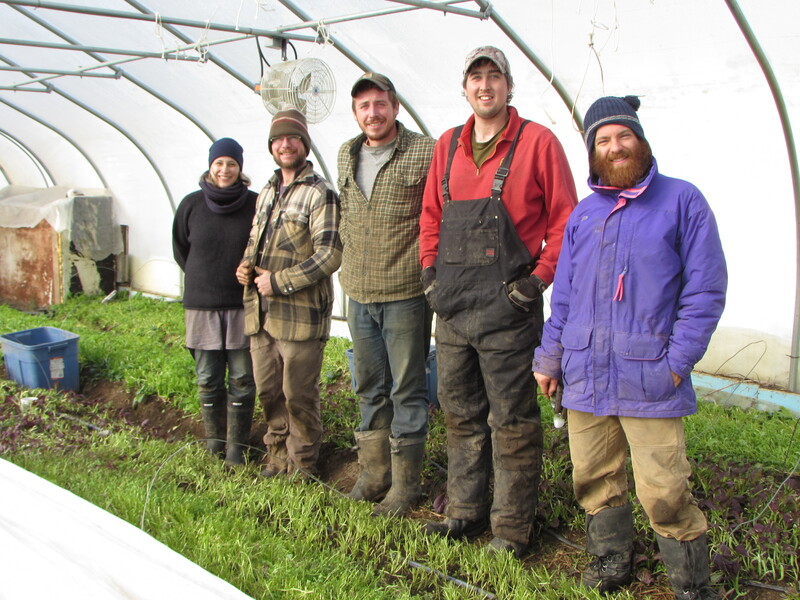 Our goal is to increase the viability of local food as a year-round option in our region. We operate an innovative system of 5 heated greenhouses that use radiant floor heating to grow greens through the winter. 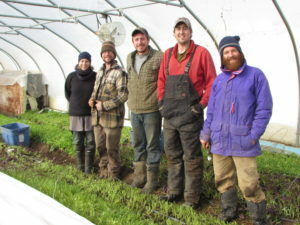 Combined with extensive cold storage to store our field crops, this allows us to offer a unique Winter Community Shared Agriculture (CSA) program. Last winter we supplied 157 CSA members with biweekly baskets of produce from October through March. We also deliver greens weekly to restaurant and retail customers in the fall and spring. In this way we aim to help fill the gap in local produce throughout the off-season. Our approach to farming is informed by our backgrounds in environmental science and sustainability education. We are certified organic, and emphasize soil health and fertility as the foundation for growing healthy and delicious food. Our unique business model is driven by continuous research and learning; we are always experimenting with new crops, growing techniques and methods for season extension. Our farm’s innovation and leadership has been recognized by the Premier’s Award for Agri-Food Innovation Excellence, as well as grants from the Ontario Local Food Fund and the Eastern Ontario Development Program. This year we are growing over 4 acres of field crops that will go into our 2017-18 Winter CSA baskets. We also grow a wide variety of salad and other greens in our ¼ acre of greenhouse space, for our CSA and wholesale customers. We are aiming to offer a new Spring CSA program for 2018 and will be developing this through the fall and winter. Greenhouse production: ongoing planting, weeding, irrigation, harvest and maintenance of greenhouse crops. Field harvest: harvest, processing, storage and inventory of field crops for winter CSA. CSA boxes and wholesale orders: wash and pack produce for weekly CSA boxes and wholesale orders; local delivery of boxes/orders. Infrastructure construction and upgrades: projects may include upgrading our woodshed, building an outdoor seedling station and washing station, expanding our heating system to include our vegetable storage, installing an internet connection in our barn, etc. Development of the Spring CSA program: this could include marketing, sales, crop planning and production. We will do our best to match your tasks to your abilities and experience. If you have a specific skill or interest that can help on our farm, please let us know! Salary will start at $12-13/hr depending on experience, plus vacation pay. This position is covered by WSIB. Funding towards this position requires us to hire someone 30 or under, who is a Canadian citizen or permanent resident. We are looking for someone to start between August 21st and September 5th 2017. The contract will end on December 22nd, with the possibility of continuing in the new year or returning in the spring. Hours of work are Monday through Friday, 8:30 to 4:30 pm. Please email your resume and cover letter to Leela Ramachandran at leela@bluegrassfarm.ca. Applications will be accepted until July 10 2017. Thank you to all who apply, however we can only follow up with those selected for an interview. Applicants will be reviewed as they are received, with interviews booked the week of July 10.